Image Size: 33" x 16" Paper Size: 36" x 20.25"
Captain Richard L. West was the first and leading ace of the 35th Fighter Squadron, 8th Fighter Group, Fifth USAAF. West flew 173 combat missions in the Southwest Pacific Theatre during WWII, encountering enemy aircraft on only 8 occasions and being credited with 14 confirmed aerial victories and three probables. West was awarded the Distinguished Service Cross, the Silver Star, the Distinguished Flying Cross with one Oakleaf Cluster, the Air Medal with seven Oakleaf clusters, and two Presidential Group citations. Those who had the privilege of flying with West acknowledged his consummate flying skills. 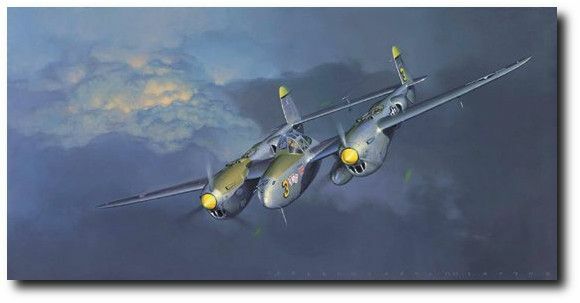 The P-38J that West flew in 1944 is seen in this painting.